The following story was written for the weekly Friday Fictioneers prompt posted by Rochelle Weisoff-Fields on her blog, Addicted to Purple. Check out her website and click on the blue InLinkz frog below to read others’ takes on the photo prompt. You can also add your own! She’d seen these. She’d hoped never to see them again, certainly not in her brother’s home. She breathed. They were rare. In months of ocean investigation on the Linnaeus, they’d only encountered them once—once, but half the crew was killed. 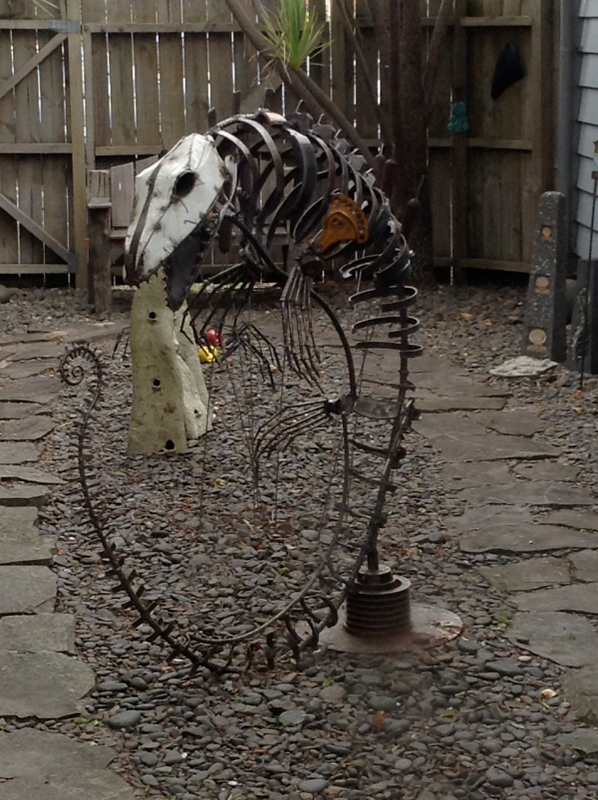 Now, miles away, one’s skeleton posed innocently as a conversation piece. Later, they walked on the beach, catching up. She loved the ocean. One creature couldn’t ruin it. Wendy saw three, scaly backs moving in tandem. Not dolphins. She shivered. The following story was written for the weekly Mondays Finish the Story prompt, run by Barbara W. Beacham. Click on the blue InLinkz frog below to read other stories based on this photo prompt and first line, and add your own! 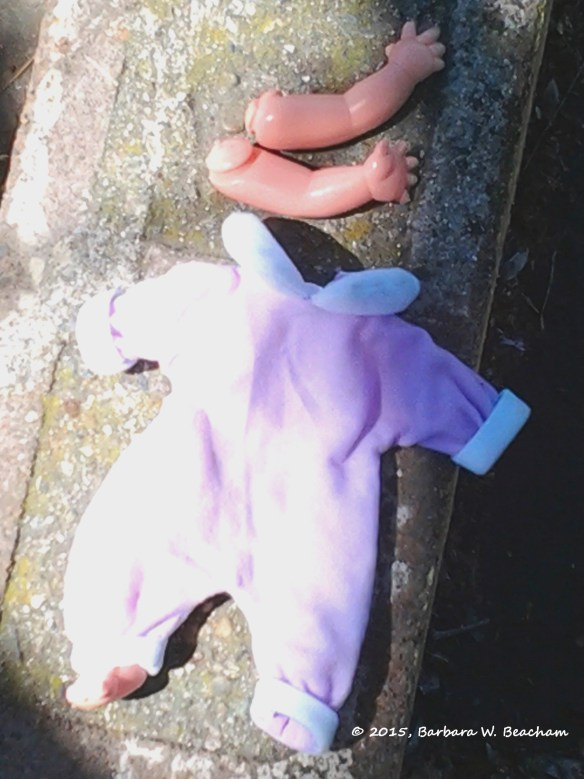 “After losing her head, she realized that the rest of her body was falling apart!” Errol said, tearing the arms from his little sister’s doll and dropping them beside the head and legs. His sister, Bronwyn, had tears in her eyes. “Eh, Bronny?” Errol grinned with his missing front tooth, dangling the naked torso. Bronwyn went inside and up to Errol’s bedroom, stopping in the kitchen on the way. She scooped Errol’s toy soldiers into one of Mama’s cooking pots and topped it with the glass lid. She slipped out the front door, set her cooking pot on the driveway, and went to watch a video. Later, she collected her green plastic stew and placed it on Errol’s bookshelf. When the truth came out, both children were punished. Their parents, however, failed to see the greater danger. The children took a cold-hearted delight in causing anguish. Perhaps, if their parents had seen this clearly when the children were still young, something could have been done. Published today with Gravel Magazine! Hello! Happy May! I am excited to announce that my short story, “The Prophecy,” was published today in Gravel Magazine‘s May issue! What determines a person’s fate? 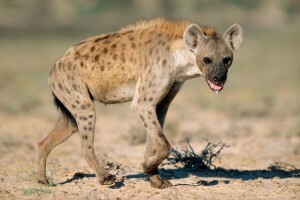 What do hyenas and a hawk have to do with destiny? Find out here, and then click around Gravel and read the wonderful fiction, poetry, flash prose, creative nonfiction, and book reviews posted there. Also, please check out a wonderful story, “Time Capsule,” by good friend Lisa Pais in the most recent issue of Nebula Rift. This is a science fiction story that explores what it really means to be human and is a must-read!